"AZ-FIN" designs are generated from great vast of experience and careful study of flow geometric pattern. The special louver opening created excellence turbulence and eliminate laminar flow. 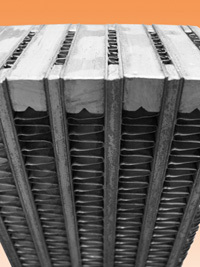 This high quality block fins have advantages for higher heat transfer efficiency, lower pressure drop, increase airflow rate, stronger fin to tube bonding and lesser induce vibration. "AZ-FIN" can also use together with wireloop tube insert to further improve heat transfer performaces for applications in air-air, air-oil and air-high viscous fluid. Plate Fin Exchangers that are abled to provide high heat transfer efficiency, are widely used for compact and ruggedness design applications. 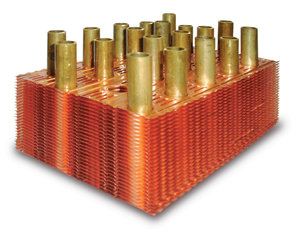 Some common examples of usages are Marine Engine Charge Air Cooler, Hydraulic Crane Oil Cooler, Evaporator Coil, Gas/Air Compressor Inter & After-Cooler and Lub Oil Cooler.